The Sun is now in the Archer’s sign, Sagittarius. 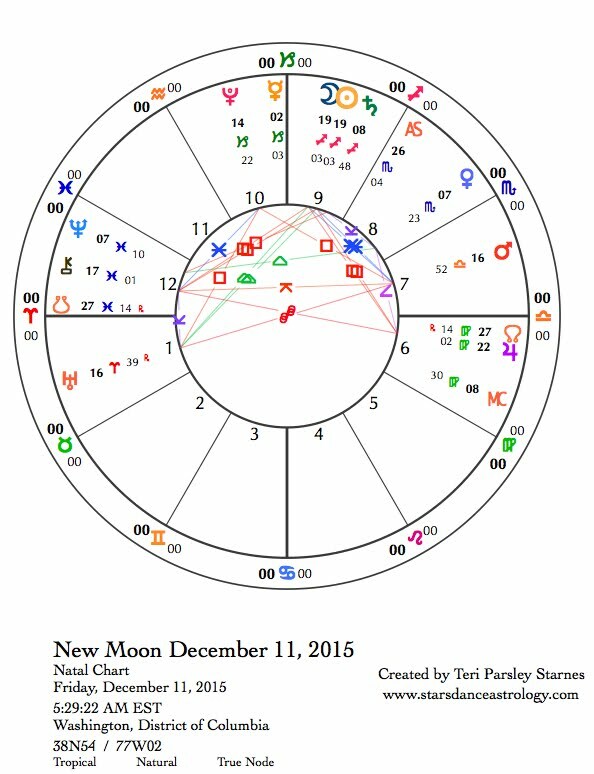 Our next New Moon on December 11 will occur in this mutable fire sign. This is the astrological season of searching, visioning, and storytelling. Common wisdom says that Sagittarius is a jovial, uplifting sign. Ruled by Jove himself (otherwise known as Jupiter), Sagittarians aren’t supposed to feel the weight of the world on their shoulders. But that doesn’t seem to be the case this year. Poor Archers, Saturn has come to visit this holiday season. Only coal for you! Or in keeping with a Saturn theme, only lumps of lead. Funny thing about this lead, it may also be turned to gold. Saturn’s leaden transit through Sagittarius for the next two years could reward us with the philosopher’s stone. The stone that alchemists say has the ability to turn lead into gold. This transformation is a guiding metaphor for every Saturn transit, to find the gold within our obstacles, to earn mastery through our hard work. As the storyteller who seeks meaning and truth, Sagittarius is the philosopher’s sign. Perhaps hidden in this lunar cycle is the wisdom of the philosopher’s stone—the power to transform hardship into blessings. Feeling hopeful or powerful just may be the last thing you can possibly imagine feeling right now. That is a sign that Saturn is at work. Saturn presents the real picture of things tinged with dire omens. As Saturn transits through Sagittarius, a sign that usually offers hope through meaning, we may be stretched to come up with the reason to keep trying to change the bleak state of the world. I find it helpful to name my despair so that there may be room for something else to grow within my soul. This may look like hope or answer, or a way, but it is too soon to tell. The Saturn process takes its time. We can’t force ourselves to move from hopelessness to hope just because we are uncomfortable. It has to come in its own time. Alchemists know this. The search for the philosopher’s stone is a lifetime’s work. Rich gold comes from the dedication and the effort. Now, if you are feeling despair, as I am about many of the world’s problems, know that we are not alone. Know that there is a process of transformation. Know we are part of that process. It takes time. The most notable thing about the week ahead is the opposition of Mars in Libra with Uranus in Aries on December 10. Tense aspects between these two planets have been known to set off uncontrolled reaction. Acknowledging the pressure we feel and being proactive rather than reactive can help to channel this energy into positive directions. The next day of tension this week, December 13, includes a challenging t-square aspect pattern of the Moon and Pluto in Capricorn square to the opposition between Uranus and Pluto. The pressure to control erratic forces could be strong. This could feel like oppression or manipulation. If this is the case, the opposition between Mars and Uranus could fuel actions to become free of such forces. December 7—Balsamic Moon: Surrendering. We let go of one story so that we can begin another. This lunar cycle began in the sign of Scorpio, the season of communion with the unseen world, and then moved at the Full Moon into the reflection between Sagittarius (Sun) and Gemini (Moon). These two signs invite us to contemplate complexity and to be curious about, rather than certain of, our truths. From the underworld to the overworld, we’ve traveled far this lunar cycle. Whatever merit we’ve attained through our mindful attentions in this lunar cycle is now offered to Mystery. Perhaps like me, you have to watch yourself for fundamentalism—knowing the truth for everyone. I seek to offer that certainty to Mystery so I may dwell in rich complexity. This offering feels important to moving through the next cycle. Today the conjunction of the Moon with Venus in Scorpio (fixed water) helps us release emotion. The release can be transformative and healing. 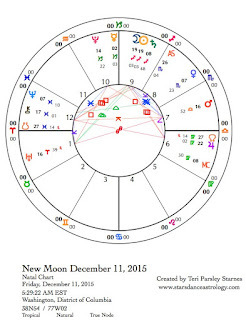 The Moon also makes a trine to Neptune in Pisces (mutable water) inviting a surrender of knowing what comes next. Be in the fluid moment. Tuesday, December 8. The Sun in Sagittarius (mutable fire) supports Uranus in Aries (cardinal fire). The weight of the world lightens a bit as we become energized to take action, tell a truth, break away from inertia. The opposition between Mars in Libra (cardinal air) and Uranus is building in pressure until it is exact on Thursday. With the support of the Sun, we feel bolder and perhaps more stable in our steps outside convention. What will you dare to do this week that brings you closer to the world you envision? Wednesday, December 9. It may be useful to share our stories of vulnerability today. The Sun in Sagittarius (mutable fire) makes a square to Chiron in Pisces (mutable water). Chiron, the Wounded Healer, has been delving into the mysteries of water and the communion of wounds. In an isolating world, we have the opportunity to connect when we acknowledge shared vulnerability. Considering the Sun’s position, we may want to pull away from this intimacy. That would be a mistake. Risk exposure. Later, the Moon moves into Sagittarius too, we may notice the need to release the stories of this past lunar cycle to make room for the stories to come. Mercury moves in Capricorn (cardinal earth) for the next three weeks, lending a desire to think and speak with clarity and purpose. Thursday, December 10. The day presents an interesting mix of sober responsibility and highly reactive explosions. The Moon in Sagittarius (mutable fire) squares Neptune in Pisces (mutable water) then conjoins Saturn. We may experience the disorientation of mass illusion and oppressive reality all at once. What are you noticing about your ability to stay hopeful and engaged in work? The urge to escape or project blame is strong. The way through may be simply to acknowledge our grief as real. Late in the day, Mars in Libra (cardinal air) opposes Uranus in Aries (cardinal fire). Considering that a new lunar cycle begins tomorrow, we are impacted strongly by forces outside our control. As I said in the introduction to the week, “Acknowledging the pressure we feel and being proactive rather than reactive can help to channel this energy into positive directions.” Mars in Libra provides a strong desire to seek justice. We want to right the scales. Uranus pushes us to act. December 11—New Moon: Dreaming. Pay attention to your hopes and despairs today. They are both informative. The New Moon in Sagittarius (mutable fire) is an opportunity to notice the complexity within and around us. Problems seem insurmountable. We know big changes need to happen. The role of Sagittarius is to infuse our spirits with the flame of belief. Perhaps belief and hope are the same thing. Perhaps one leads to the other. I am suggesting that the work of this new lunar cycle could be to fully acknowledge our despairs while holding the paradox of hope. Saturn in Sagittarius turns a usually optimistic sign like Sagittarius into a curmudgeon. The change in perspective is actually an opportunity to infuse our dreams with reality. The better our feet are planted on the ground, the higher we can reach. It isn’t easy maintaining a firm connection with the ground while Neptune in Pisces (mutable water) is making a square aspect to Saturn. This is the transit of the year, coloring our experiences of hopes and despairs profoundly. Chances are we are feeling big feelings during this initial phase of the lunar cycle. The Sun and Moon are square to Jupiter in Virgo (mutable earth). Neither Virgo nor Sagittarius are known for emotional responses. However, Jupiter makes whatever we are experiencing bigger. So if you feel despair, the despair is bigger. If you are feeling wild hope, that is bigger too. Since Jupiter is in Virgo, these big feelings may have us working harder to be of service, to achieve perfection, to create wholeness and healing. Watch out for stress. Self-care is essential. Venus in Scorpio (fixed water) forms a supportive trine with Neptune in Pisces (mutable water). We may not be feeling real friendly (Venus in this sign often isn’t), but with those we trust, we are able to go deep and connect in meaningful and healing ways. This imprint on the entire lunar cycle is important to remind us that emotional experience is as important as action and thought. Saturday, December 12. W.B. Yeats wrote, “In dreams begins responsibility.” That sober awakening today comes when the Moon moves from Sagittarian dreams to Capricornian responsibilities. To honor our dreams, we must make those hopes real. To do that, we must work. Dreams still hover around our obligations, with the Moon making favorable aspects to Neptune in Pisces (mutable water) and Venus in Scorpio (fixed water). Sunday, December 13. The Moon is sometimes a trigger for aspects between planets. Recently, Mars in Libra (cardinal air) opposed Uranus in Aries (cardinal fire). Today, the Moon in Capricorn (cardinal earth) conjoins Pluto in Capricorn, then squares Uranus and then squares Mars—all before 10 am CST. The day could start off with triggers that reverberate throughout the day and possibly into next week. Mars seeks to right the scales of injustice. Uranus urges us to act boldly to change the status quo. Pluto uncovers the toxins not so hidden in our governments and systems. Once again, we feel the need to purge. Some may choose violence, others a more measured way to bring about transformation. Our intentions and choices matter.